I bet you thought I wouldn't get a post up today! Well, it's still Friday, and here I am -- just squaking it in. Today was very dark -- I kept waiting for even a patch of sunshine to take some photos -- and by 3:00, when it looked like the sun had gone down and it started to pour freezing rain/hail/slush, I knew it was a lost cause. I had planned a review of a book with illustrations that warranted sharing, so instead I've had to come up with an alternate plan. Lots of people email me to ask for advice and suggestions for beginning a seasonal observance of festivals and celebrations in their homes, so I thought I would share with you my very, very favorite resource today. 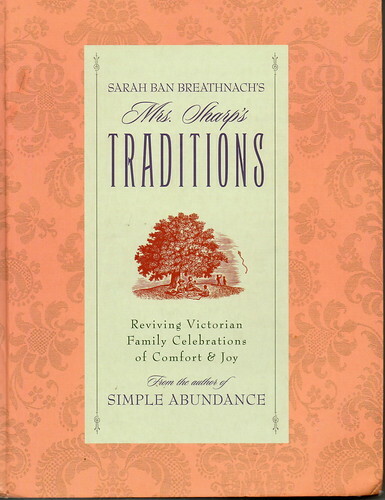 Mrs. Sharp's Traditions was the first non-pregnancy/birth/breastfeeding mama book I ever read --while I was pregnant with Elisabeth. The style is humorous and may be off-putting to some (it's written a tone mimicking a Victorian ladies' advice book or magazine), but that is really so perfect for me. The amazing, wise thing about this book is that it draws parallels from another time with our own time. It really is all about how to reclaim family life -- I think so many of us feel powerless and end up throwing our hands up in defeat. Mrs. Sharp is here to show you simple ways to make home a warm respite from the impersonal, face-paced world outside. The first part of the book is about daily rituals that help to bring harmony, balance, and predictability to family life. The rest of the book (the majority) follows the year month by month, discussing different festivals and seasonal customs and pastimes. Part historical, part practical, part humorous, but always full of grace and charm. In my early days of parenting, Mrs. Sharp was like a trusted friend, always giving me a bit of steadying wisdom as I navigated my new role as a full-time, at-home mama and keeper of the home. Some of you had asked for some more details about our family's celebration of Martinmas. I didn't elaborate on those answers for a couple of reasons -- one was that there wasn't too much I didn't share in my previous Martinmas posts, and the other was that most of them came from this book. So, hopefully this will be helpful to those of you who are looking for additional information. Have a great weekend, everyone -- I'll be here with some weekend posts at some point on Saturday and Sunday. See you then!